I was deliberating, shall I stay or shall I leave Kpalime. I adhere to this way of dealing with rain, except for the afternoon monsoon thingy. It has started to rain here in Kpalime and is nice, cools off the place and makes life nicer, stops road dust and cleans the planet. It is 8:12 am, I would say this is a most of the day thing, or could be, not a day to travel. Thanks rain, I blame you for my decisions today. I go NORTH, I want to land in the Yellow or as close to that an Atomic Bomb, not really close, just in the area. 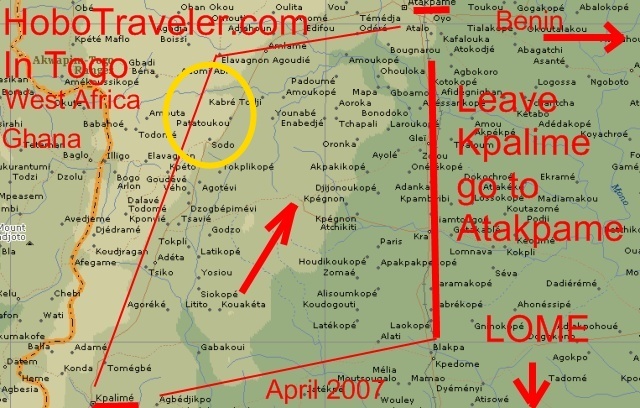 I am going to go from Kpalime to a good question village, north of here, anywhere but here. This is difficult travel for me, I do not speak French, and my Mina is only good to call a girl over to talk, not really to talk. Va and a down wave of the hand, and they come, what is up with this Yeh Bow. 95 percent come ratio, and the others know me and just are not coming. I want to go North to a village that is small, has something to sleep, maybe an Auberge and is un-touched as much as possible for Togo by the out-side world of cell phones, TV, MTV and the other annoyances we call progress, and I call fashions. I sometimes think I am doing this HoboHideOut.com Hotel and Room site for purely selfish reasons. I want a list of all the hotels in every village on the planet. If I has a good list of every hotel, big, small or insulting in Togo, I would have a better idea on how to plan to leave Kpalime. I do not want to do the big Tourist City to Tourist City jump, obey the guidebook shuffle. Follow the guidebook, pray to the Yellow Bible, obey the maps, follow the path. I am an iconoclast by nature, I never obey, you say not to go, I go. I have a allergic reaction to tourist, Africa is great, nobody but me, and a smaller group of people not really here doing much, IF I stay out of the bars, my even worst allergic reaction is avoided. I do not like NGO or ONG people, if I do not go to the Buvette, Bars, or Tourist Fare restaurants, or the AC Western hotels, I can not have an allergic, annoyed attack to the NGO people. I am going to the small village they say they are helping, and never there to be found. Ok, how to find a small village, and find a room for my head, when I do not speak Mina, the language of Togo. French is just a supplementary language and spoken as a need, not a first language, and not in conversation by the locals. The more remote, the less French spoken by the locals. However, if I spoke the nuance level of Fluency of French, I could cut through the crap and find a room. If I say Hotel, they say no, if I say Auberge, they may say yes, if I say I want to sleep, they will find a place and who knows what they call the place, and who cares I want a room, the words are not important. I sometime will just land in village and say, I want to sleep, call it what you want, but take me to places to sleep. Then I have to convince them in Africa, that white people will sleep in the same places as the locals and that sleeping is sleeping, we do it the same. A off-road motorcycle would probably be ideal here, not a big lunker, a dirt bike, where I could go explore the small villaged and find a room. I think about a Peugeot Van, them big square ones, it would work, and easy to get repaired. I do not like police at borders, therefore the idea of sitting around and talking to the annoying police at borders, trying to beg and bribe my way across the continent makes me annoyed to think about. The idea of vehicles to drives seems too complex and full of headaches I do not pay to have. Ok, the target city is yellow, and anywhere they say I can sleep in this area. This become work, as I spend the whole time in the collective taxi trying to do a what if question, is there a hotel, and can I live there. Everyone in the taxi knows exactly their start and finish points, they cannot think in maybe or hypothetically. On or off switches only.